DO YOU WANT GET BETTER AT MAKING ART? What can I do to take my art-making to the next level? Would I benefit from creating with experienced facilitators and beside serious, like-minded artists? Where can I find workshops that promote me developing my own style and voice? I’m excited to announce I’ve received certification as a GOLDEN Artist Educator! 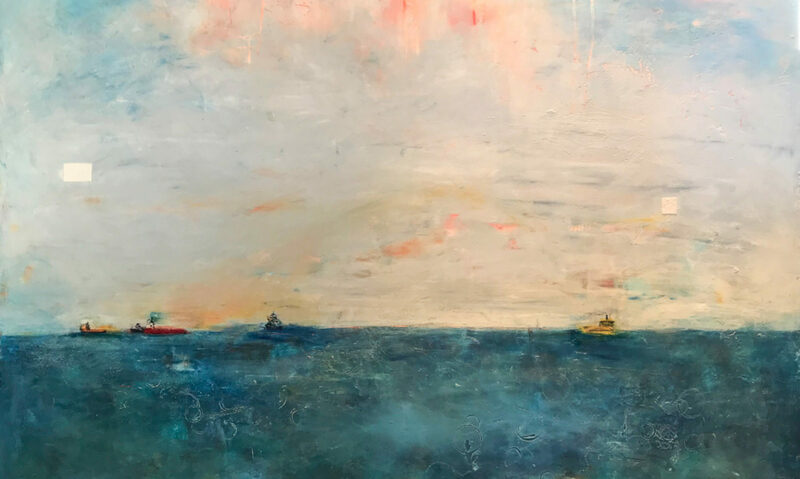 The training I received covered the full range of GOLDEN acrylic, watercolor and oil paints and related mediums (gels, pastes and grits) and allows me to use and teach with their products much more fluently to facilitate workshops that address these questions. My workshops offer a bounty of supplies and information where you will be in the company of other artists who are generous to share what they know and also learn from one another. The workshops are small so that each person gets personal attention. My style is information-rich while being gentle and supportive. I encourage artists to take risks, listen to their own voice and problem-solve. I use GOLDEN artist materials in my workshops! The GOLDEN line of products is extensive and unlocks huge potential in every artist, no matter the media. I offer art workshops in San Francisco Bay Area (CA) and Franklin/Nashville (TN). Please be sure to make note of the location before you sign up! For fee classes, I take PayPal Friends and Family using my email. Your registration will be confirmed when payment in full is received. I also offer specialized/custom workshops in CA, TN or at your location. These can be themed for your group’s area of interest and location. If you want to arrange one of these workshops, please email me and we’ll put it together. My 2019 workshops and classes are listed in date order below and can also be found on my GOLDEN Artist Educator page as they are scheduled. PLEASE be sure to note the venue locations as they vary. All workshops are limited to 12 people, unless otherwise noted. Registration/cancellation policy is at the bottom of this page. This Golden Paints workshop is an experience of both printing making and painting. Spur yourself deeper in all areas creative. One approach will feed another and the other approach will feed the former. This opportunity painting and creating prints all in the same two days – will encourage one to look at applying paint from many directions. Take time to learn the steps of creating great small prints and then inspired by the outcomes, dive in and paint. And repeat. 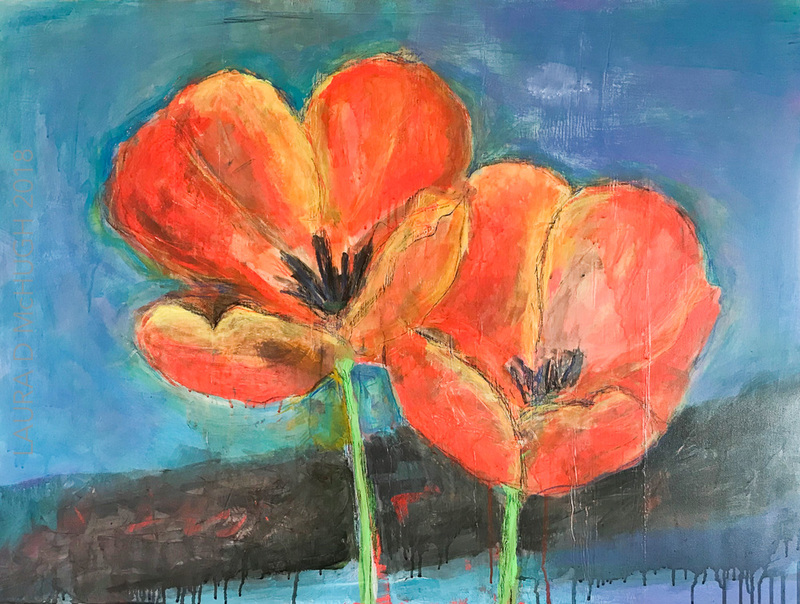 You will not only get two methods of art making, you’ll get two great teachers – Certified GOLDEN Paints Working Artist, Judy Gittelsohn and GOLDEN Artist Educator Laura McHugh. REGISTER USING THIS LINK: Sign me up for Print to Paint. In this class, we will continue to explore using do GOLDEN OPEN monoprints using Gelli plates. We will use Gelli(R) Plates to transfer images to art-quality paper using GOLDEN OPEN paints. Absolutely no drawing or art talent or experience is needed. This technique is the basis for making finished art pieces suitable for framing, and also focal points that can be further embellished or used in future mixed media assemblages. Bring any mylar or heavy paper stencils you have. All other materials will be provided. We will start with a warm up making marks. Practice using GOLDEN high-flow paints and mediums with stencils on sample fabrics, then use animal, floral and decorative stencils provided to arrange and place your design on a beautiful charcoal gray apron. Bring your own plastic stencils if you wish. All materials are provided for this 2-hour workshop. REGISTER USING THIS LINK: Sign me up for Festive Art Apron. Make a series of original and ghost-print monotypes using GOLDEN QoR watercolors printed on archival quality art paper. No drawing experience is required because we can trace images provided, or bring images you wish to paint from or trace that are 6×6” to fit on the plates. All materials are provided for this 2-hour workshop. REGISTER USING THIS LINK: Sign me up for Magnificent Monotypes. In this popular workshop, learn the basics of contour drawing with my go-to pen using simple household fruits and veggies. Work your way up to small still-life arrangements with 2-3 objects. Using GOLDEN QoR watercolor, bring your drawn objects into vibrant focus. REGISTER USING THIS LINK: Sign me up for You Can Draw! The 10 simple steps for painting a realistic flower require some patience and discipline, but you won’t be disappointed with your results. We will work together through the steps to create a beautiful hibiscus using GOLDEN QoR watercolors. Then, you can go home and start painting your favorite flowers. No drawing experience is required. REGISTER USING THIS LINK: Sign me up for Paint a Flower. You can’t draw? Surely you can trace! We’ll work on old-fashioned transparencies with pen and ink to draw your subjects, then magically print them onto high-quality watercolor paper. They dry quickly, so we can add color using GOLDEN fluid acrylics to make them pop. REGISTER USING THIS LINK: Sign me up for Ink Monotypes. Of all the things one can do creatively, books may be my favorite. In this workshop, we will make the covers for our sweet little books using Gelli Plates and GOLDEN Open acrylics to print onto high-quality art paper. We will embellish and complete these images, then learn how to stitch them into a book filled with pages for your notes, recipes, or small drawings. All materials are provided for this 4-hour workshop. REGISTER USING THIS LINK: Sign me up for Sweet Little Books! Make a series of original and ghost-print monotypes using GOLDEN Open acrylic paints and stencils that we then print on archival quality art paper. No drawing experience is required because we use a wide variety of stencils. You’ll learn how to choose contrasting colors to make your images pop! If you have a special stencil, bring it. The images we will make are 6×6” on 8×8” paper. REGISTER USING THIS LINK: Sign me up for Gelli Plate Monoprints. If you can wrap presents you can make a memento box. These boxes are right up there with my favorite project, books! We’ll make background papers using GOLDEN fluid acrylics, and focal points using image transfer techniques with GOLDEN matte medium. We will assemble our goodies onto beautiful cigar boxes over a gel or paste medium, then make a closure and finish off with a luscious layer of beeswax over the top, if you wish. You’ll learn how to avoid fussy measuring so that this is a fun and satisfying project. You may choose to bring laser-jet photocopies of any special images you want to use for your box. All materials are provided for this 6-hour workshop. REGISTER USING THIS LINK: Sign me up for Memento Boxes. Transfer an image to raw unstretched canvas then paint it with GOLDEN High Flow acrylics that burst with color. Finally, we will apply a beaded texture to make it really sparkle! REGISTER USING THIS LINK: Sign me up for Image Transfers. Workshop Policies: Due to limited class size, payment is non-refundable, but may transferable. If you purchase a workshop and are unable to attend, AND if there is a wait list for the course, we will put you in contact with the first person on the wait list for the workshop. If that person agrees, he/she can pay you for your spot in the course. Once that transaction is completed, we will substitute that person for your spot in the course. If you are unable to attend the workshop, and the workshop has not sold out with a wait list, we will not be able to refund your purchase. Cancellations: If the event does not reach the minimum number of participants, the workshop may be cancelled. In the very rare event of an emergency or unavoidable natural disaster or act of God, the class may be cancelled. If this is to happen, all purchased workshops will be reimbursed to students in full via the original method of payment.